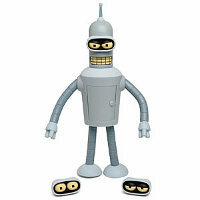 Futurama fans, it is time to sit up and take notice of the Talking Bender Figure! Standing tall (or short, depending on your point of view) at 9″, this is a full fledged talking Bender figure from the Futurama cartoon series. He will definitely rattle off your favorite, what shall we call it, Benderisms in order to inject some humor into the situation, especially when it gets particularly tense around the water cooler. Bender’s ribcage compartment can also be opened up for you to stash away some of the more secretive items, or stuff that you do not want your colleagues to find out about. The Talking Bender Figure will retail for $24.99 a pop, and all it takes to get him talking would be to press a button, and he’ll rattle away digitally. A desktop companion with an attitude – we definitely could do with one of these at the office.